DELAGO DELUXE (AUS) (Bay 2008-Stud 2013). 7 wins-4 at 2-to 1200m, Scottsville Golden Horse Casino Sprint, Gr.1. Out of a half-sister to SW Duporth. 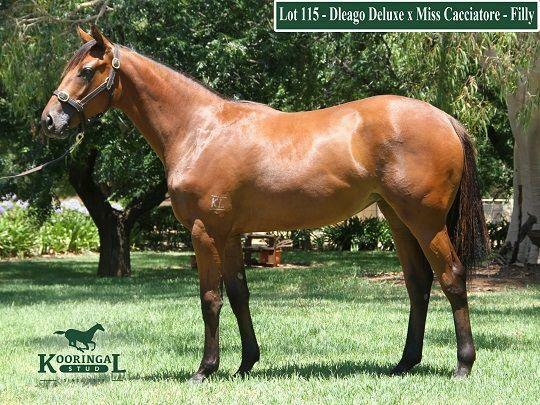 Sire of Massagi, Deladies Boy, Delago Thunder, Delude, Derham Park, Miss Casier, Rooibos Deluxe, Velago and of the placegetters All Sassitude, Casa de Lago, Deago Deluxe, Eloquent King, God Sent, Inde Roar, Little Naive, Miss Delago Rose, Revlis, Rikers Island, Scarecrow, etc. His oldest progeny are 3YOs. Casa de Lago (f. by Delago Deluxe). See below. Electronics Spur. 5 wins from 1400m to 2000m, A$21,775, HK$2,755,500 in Aust. and HK, HKJC Audemars Piguet Deva H., Guilin H., William's Coach H., 2d HKJC Maybach H., Peng Chau H., Hoi Ha H., 3d HKJC Hung Mui Kuk H., Broom H., Resfa H., Luard H., Walker H.
Speedeor. 4 wins at 1000m, 1100m, A$159,300, to 2017-18, Ballarat TC Magic Millions 3 & 4YO Classic, VRC Schweppes#flemingtonfling S., MRC Tile Importer H.
Countersnip - Po Ching Treasure (H.K.) (Stratum). 4 wins-1 at 2-from 1200m to 1800m, A$126,450, HK$2,919,275, to 2016-17, HKJC University Hall H., Grass Island H., MRC CRV Hospital Helping Hand H., 2d MRC Autumn Classic, Gr.2, HKJC Collection H., France Galop Cup, Mei Zhou Hero H., Murray H., Gloucester H., SAJC Ryan Ferguson H., 3d TTC Tasmanian Guineas, L, MVRC Alternate Railway 2YO H., HKJC Chevalier Property Development H.
ZERO DRAMA (Danzero). 7 wins from 1400m to 1800m, A$409,100, Kilmore Cup, L, MVRC Geoff Torney Cup, VATC 125th Anniversary H., New Statesman H., Jayco Caravans H., VRC Aluminates Chemical Industries H., 2d Pakenham Cup, MVRC Wedgwood Vase H., Kwik Lok Welter H., Good Luck in 2004 H., VATC Lord Reims H., VRC Tauto Welter H., 3d MRC Silvan Australia P., 4th Kilmore Cup, L.
Race Record: 6 Starts 0-2-0 A$14,820.